In July Helen and Katherine from our Mediterranean team took a trip to France. Here is what they thought…. An early start from the UK meant that we landed in Toulouse airport at just after 9 am local time. The airport looks modern and it is quite small so very easy to get around. We picked up our hire car with Avis which took no time at all (the office is just in the terminal building) and headed out towards the coast. The majority of our day was in fact spent in visiting a couple of potential new properties. On our way though we passed through Carcassonne, a beautiful medieval town set up on the hillside, the setting for Kate Mosse’s popular novel Labyrinth. There are some lovely cobbled streets to explore and restaurants to try, certainly worth a trip if you are in the area! La Reserve Ramatuelle; one of the most prestigious hotels on the Côte d’Azur and a brilliant new addition to our collection is where we were headed. With an enviable position just below the village of Ramatuelle and boasting panoramic views over the Mediterranean, the Reserve really has one of the most peaceful and spectacular locations that I’ve ever been to. We arrived at dusk, which is definitely the perfect time to visit…. The sun’s heat was just fading gently, cicadas were out in full force and the subtle scents of lavender pervade the whole area. Despite the warmth, the hotel is lush with greenery all the way through. The hotel has an exceptional feeling of peace and relaxation, with all rooms and restaurants designed carefully to benefit from the stunning surrounds. To really make the most of the views I’d highly recommend taking a glass of champagne at the rooftop bar where you can sit back, taste some of the delicious local olive tapenade and sip a cool glass of champagne by candlelight – Glorious! Interestingly the champagne is served from what I think of as a red wine glass, apparently to truly appreciate the aromas of the champagne! The service and facilities at Ramatuelle are sheer class, with a beautifully minimalistic feel to the décor; everything is hand-picked and incredibly tasteful. They even have their own signature scent, a subtle blend which appears everywhere from the bathroom products through to candles in the restaurant. 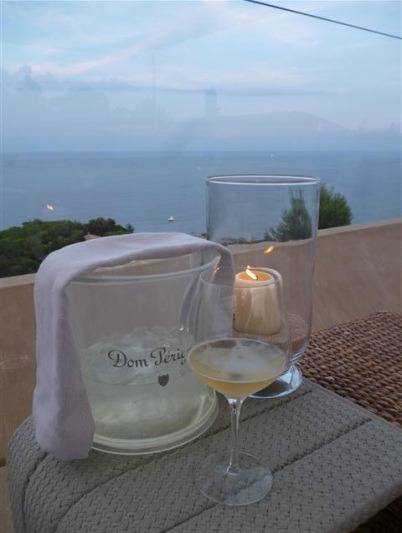 From the gym cut into the rock face, to the terrace and garden that comes as standard with every suite, the hotel is designed perfectly and is suited either to those wishing to get away from it all, or as a tranquil base to explore the glitz and glamour of St Tropez. Heading north we then ventured into more traditional France, to Seillans, a charming village in the heart of rural Provence. The next day was spent predominantly hunting for new and interesting additions to our collection in the vicinity but ending at the Terre Blanche Hotel, Spa & Golf Resort, one of our firmly established favorites. Formally part of the Four Seasons brand, the resort changed management last year. It very much offers the quality and service that you’d expect from this former partnership, but they are, if anything, now even more focused on providing the best for their guests. With such a wealth of authentic Provençal villages to explore, we actually decided to visit one of the local restaurants for dinner, deciding on Callian on recommendation. 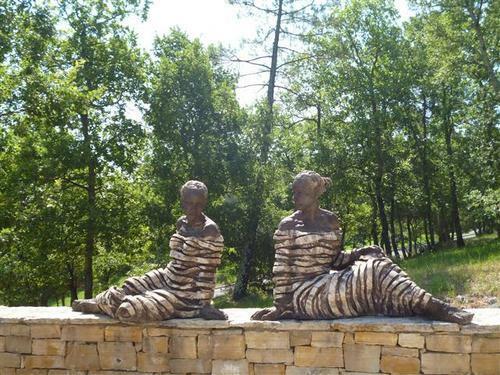 The village is a 10 minute drive from the hotel where you can really immerse yourself in the true Provençal lifestyle. 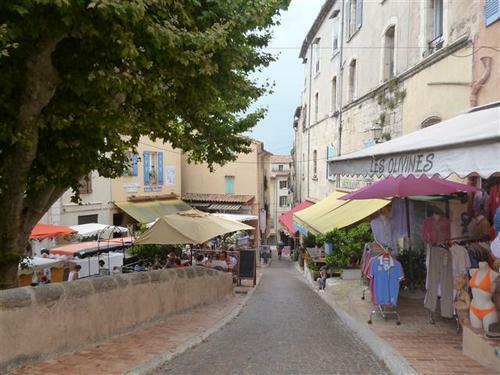 Callian is just one of many villages in the vicinity with twisting cobbled streets and a small but excellent selection of restaurants, most of which have table tumbling out onto the village square with a welcoming, lively and family orientated feel. Back at Terre Blanche I had a wonderful night’s sleep in one of their Suites: a 60 sqm room consisting of bedroom, separate living room and huge furnished terrace – the hotel’s entry level room! 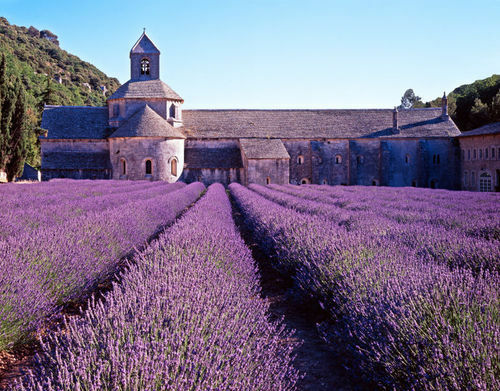 The bathroom products have been specially formulated for Terre Blanche by Fragonnard which is a perfumery based in Grasse, around an hour away (if you would like to visit they offer guided tours which is a great day out). Feeling rejuvenated, we headed for the gorgeous breakfast terrace where they offer one of the best breakfast buffets I’ve ever tasted. The strawberries in basil syrup are not to be missed! The whole hotel has a wonderful fusion to it; the rooms have kept a true feeling of rustic Provence, decorated in muted terracotta tones with tiled floors and a huge amount of space. The communal areas tend more towards the contemporary, whilst artwork spotted everywhere effortlessly eases the transition between the two styles. For me the crowning glory is the abundance of lush green vegetation: cheerful flowers in pinks, oranges and reds to brighten the walkways; trees and bushes provide much needed shade and also ensure privacy for your terrace; and of course everywhere the subtle undertones of lavender. Naturally sports are a feature of the hotel, there are a couple of good quality hard tennis courts and coaching can be arranged. 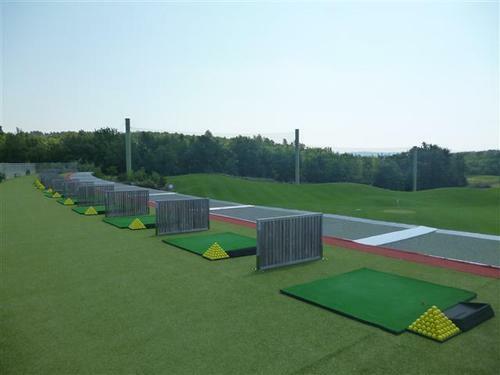 The two championship golf courses are fantastic, there’s a stunning driving range, Pro shop, gym and every ultra modern gadget for improving your technique that you can imagine, including Huber Motion Lab and all kinds of video technology. One course is reserved for members and guests only, so there’s very much a priority given to those staying at the hotel, but the other course is open to external players. However, those who worry about the ‘Golf’ in the Terre Blanche’s title need not panic; both courses are on the far side of the resort to the hotel, pool, spa etc. so you need not ever touch this part of the resort if you prefer to distance yourself! As you would imagine from the name, Terre Blanche also boasts a beautiful spa area, with 14 treatment rooms (though you can also request to be in one of the poolside cabanas) indoor pool leading onto an outdoor vitality pool, sauna, hammam etc. This really is a place to spend some quality time. 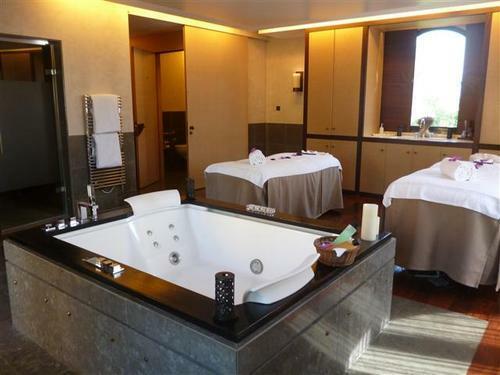 Consider perhaps taking one of the couples’ treatment rooms, where you’ll have two massage tables, hammam, jacuzzi and private sun terrace at your disposal for two hours for example. With the resort being so focused on family life the children’s club definitely doesn’t disappoint. It’s set just slightly apart from the main hotel. 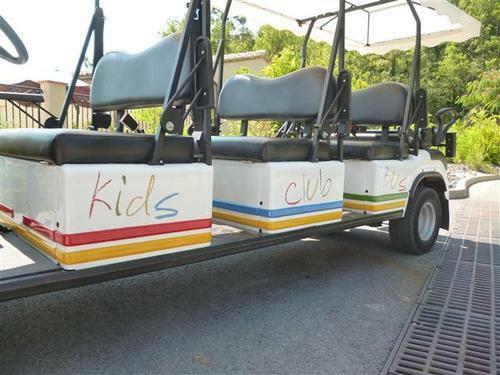 The children are picked up by the ‘kids’ club bus’ golf buggy in the morning and taken down to the club. The club itself is just fantastic, a huge indoor space with various rooms for soft play, Lego, creative play, amongst many other things. 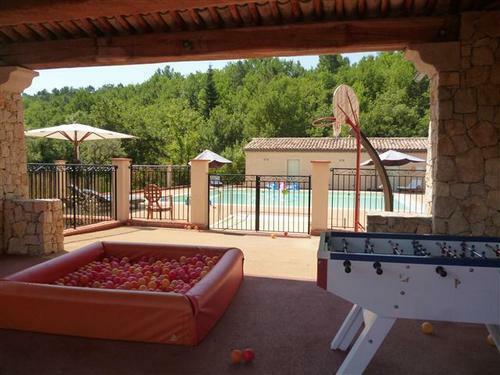 Outdoors there is a shaded soft-floored play area with table football and ball pit leading onto a children’s shallow pool where swimming lessons for the younger ones can be arranged. There will always be several of the childcare team in the club including at least one fully qualified lifeguard. It isn’t necessary to book, but it is preferred since they can plan better this way. A schedule of activities is available each week so you can plan ahead. The club caters for children between 2 and 12 years; it opens from 09.30-12.00 and 13.30-17.00, but they also offer a supervised lunchtime session at the Tousco Grill. During July and August the lunch is free of charge for under 8 and 8 to 12 year olds will pay a flat rate of €15. In fact during July/August children under 8 are able to eat every meal free of charge from a buffet provided. Apart from the Tousco Grill but the pool (which offers a fresh buffet of salads and a choice of à la carte pizzas) the resort has 3 further restaurants: Les Caroubiers at the golf clubhouse which has a good selection of lunchtime lighter bites and transforms into an Italian in the evening. The Gaudina is the main breakfast restaurant and offers lunch and dinner as well. Finally the Faventia offers fine dining with Michelin star hopes. After a superb lunch at Tousco unfortunately we had to be on our way. The good news is that it is just an hour away from Nice airport down good roads and with the added advantage of a short flight (1h 35mins) this is the ideal destination for a short break or a longer stay to explore some of France’s most impressive scenery, culinary delights and Provençal traditions.